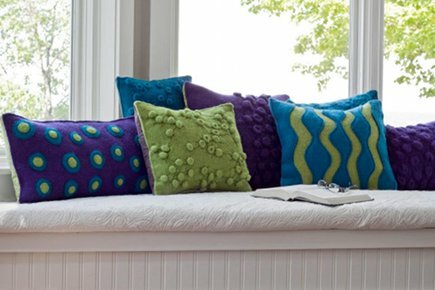 A collection of handmade decorative pillows. Alison Cannon experimented in many different art forums over the years, but she fell in love with the medium of felted wool. 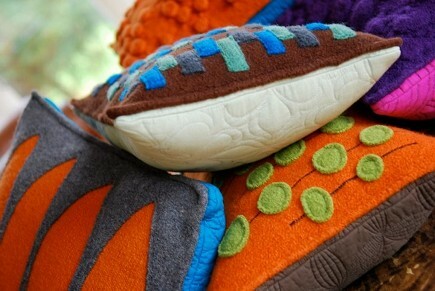 Inspiration for her felted wool pillow designs come from the textures and shapes in nature, as well as the funky 70’s. Pillow fronts are created using a combination of appliqué, layering techniques and esoteric Japanese Shibori which is a group of special binding, pleating and stitching methods adapted to materials. The pillow backs feature solid colors with hand quilting [below] while pillow faces have rich colors and playful contemporary designs. Each pillow is both a lovely crafts piece and a work of hand-stitched art.